Most people love to eat out. Just look at the restaurants in every city, and you will see that they are full of diners, not only at weekends, but also throughout the days of the week. People eat out not only in restaurants, but also at markets, food stalls, and at food trucks. Why People Love to Eat Out? Why a growing number of people prefer to dine out, instead of eating at home? Eating out is fun. You go out, see people, and eat food that you usually do not cook at home. Eating out is a symbol of status. It means that the person eating out can afford it. Sometimes, people want to save time, and instead of going to the grocery or supermarket, buy food, cook it, and then wash the dishes, they prefer to go to a restaurant. People, who work away of home, prefer to eat at a restaurant near their work place. 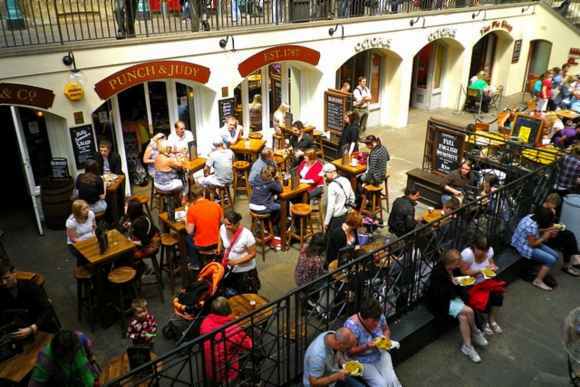 Of course, tourists eat in restaurants, diners, coffee houses, market stalls, and anywhere where they sell food. In certain places, at weekends or holidays, you can see crowds waiting outside restaurants, waiting for a table. At some of the restaurants, especially at weekends or holidays, you cannot find a table, unless you have reserved one in advance. The above are a few other reasons why people eat out, but I would like to focus of one reason of the reason – fun and pleasure. As a tourist, visiting a foreign country, you wish to try new food. It is a part of the pleasure of traveling. Of course, you can buy food at the supermarket and eat in a park, or in your hotel room, and people do that. However, many prefer to eat, at least some of their meals in restaurants, to savor and try the local food. We hear about special or unique restaurants in a foreign country, about some recommended places to eat, we read about them in travel guides, or we see them on TV, and when we travel abroad, we put them on our “to do” list. Eating out is one of the pleasurable and fun ingredients of traveling abroad, or even when visiting a city not far away from where we live. In some places, there is music, singing, and even dancing. In other places, there is a special atmosphere. This is all fun and pleasure, and most people like that. Food has always been an important ingredient of every society and tradition, throughout the ages, and everywhere. Why people love to eat out? They like that because it is a way to spend the time, and because eating is a sort of pastime and a form of recreation. Often, people eat not because they are hungry, but because it is fun and an enjoyable activity. People like tastes and colors, and they like to be in a company of other people. People like to share food with family and friends. Actually, eating out has become one of the most popular ways of recreation. It is now more than eating to appease hunger. It is a time to be out, see people and meet people. Eating out is fun, but one needs to be careful not to eat too much, just because the food looks good or tastes good. Do not overload your stomach with food. You need to take care of your body and health, and prefer food that is good for you. Eat the right quantity, not too much, and not too little, and take care to exercise your body, at least a few times a week. Do you want to bring more fun, happiness, love and success into your life? Learn how to use your imagination and visualization to bring them into your life, by following the instructions and guidance in the book Visualize and Achieve Your Dreams.